Cheese cakes are designed to please. Order cake online from Ferns N Petals and relish some of the best flavors in the land. We also have a selection of special cakes that will add to the festivity of any occasion. The Blueberry cheese cake has a rich topping of Blue berries that are so refreshing. The exotic pineapple cake online is tangy and rich and very satisfying. The lemon cheesecake is tangy and refreshing and will make you feel great. The New York cheesecake is a classic and is universally loved. The mango cheesecake has a rare combination of flavors and is reminiscent of the tropics. The blueberry cheesecake also comes in the eggless avatar. The eggless lemon cheesecake is a delight for vegans and vegetarians. The Nutella cheese cake is rich and nutty and is the ultimate comfort food. 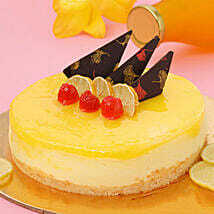 The tangy lemon cheesecake is a gourmet's delight. Order the strawberry cheese cake and delight your loved ones. The kiwi cheesecake is an unusual combination of flavors and is rich and tangy. The chocolate cheese cake will sweep you off your feet. Avail of our impressive home delivery service which delivers to India and abroad. It is guaranteed to bring a smile to your face. Creamy and comforting with a slight crunch, cream cheese cakes are the ultimate pudding to respite your taste buds. The smoothness and the softness of the cake is sure to leave you mesmerized with its taste. Blueberry and lemon flavours are the most popular ones in cheesec akes. Cheese cakes are decadent treat which are sure to make your loved ones smile. A box of chocolate will be a nice complement to this irresistible cake. Send an online personalized gift along to make your loved ones day, a memorable one. At Ferns N Petals we thought of coming up with several flavours of cheese cakes namely Strawberry, Lemon, Blueberry, Oreo, Mango and Chocolate cake online delivery in metropolitan and remote cities to name a few. These cakes are also made available in eggless category too which adds an extra bonanza of delight for our customers. Order Best Cheese Cake for Every Occasion. You can order online cheese cakes for Birthdays, Anniversaries, Valentine's Day, Mother's Day and Father's Day to name a few. They are sure to leave an unforgettable experience on your loved ones. You can send cakes online to your loved ones with our speedy delivery services which allows you to send online cheese cakes to Delhi, Mumbai, Chennai, Hyderabad and Bengalore to name a few.